The KIT20X0 was a full travel industrial keyboard, with 101/104 key functionality. This rugged keyboard is sealed to NEMA 12 (IP54) with a molded, replaceable polyurethane seal, and are combined with our high reliability trackball mouse pointer. The 2.0" (50mm) diameter trackball has a formed Teflon sealing ring in a metal collar, redundant photo-detectors and hardened stainless steel shafts; making it very durable and precise. 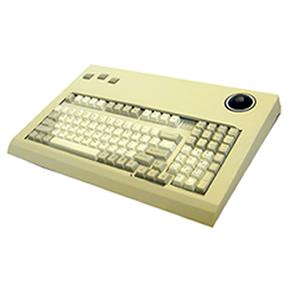 This ergonomic keyboard offered a high reliability trackball mouse pointer, and were available in anodized aluminum enclosures, which come standard with a gasket sealed bottom plate, rubber feet and sealed threaded holes for optional mounting to any work surface with just two screws.